Fleming Young, Jr. and wife Lorena during the recent “Old Fashioned Day” held at Balls Chapel Church. 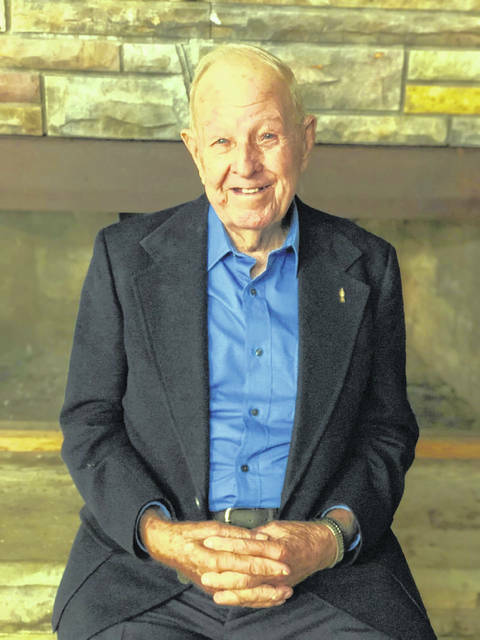 Fleming Young, Jr., pictured, recently celebrated his 100th birthday. ASHTON — A Mason County man was recently honored for service to his church and country, and was treated to a celebration of his 100th birthday. Fleming Young, Jr., World War II veteran, has also been an integral member of Balls Chapel Church since 1950. According to church members, Young, also known as Junior, was saved in 1950 at an old fashioned tent meeting. He was instrumental in Balls Chapel becoming an independent denomination church. He’s described as a pillar of the church and community. He spent many hours building the present church which opened in 1972 and has held many offices in the church, including being honored as an elder. Young built the current podium and a steeple that was placed atop the church in 1972. As the wind and weather tattered the steeple, it was replaced with a new fiberglass steeple at the time the roof was replaced. The church refurbished the steeple Young had made and placed it between the Christian flag and the American flag. A plaque engraved with his name was placed on the steeple honoring him. Young was known as the “community barber” because he had cut all the boys’ hair in the neighborhood for many years. He worked at the Gwinn Mill and later retired from Martha White Company. The church members recently showed their gratitude to him by celebrating “Old Fashioned Day.” Many of the activities on “Old Fashioned Day” mimicked the ones that Young and his wife Lorena (Renee) had participated in as children and also as adults. 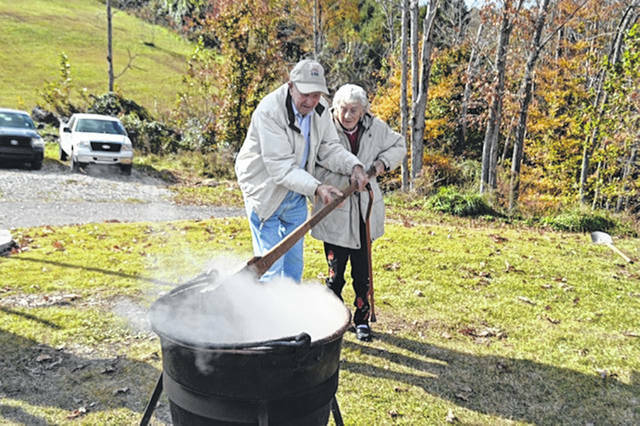 According to church members, they arrived at 6 a.m. to build fires for the making of copper kettles of apple butter and 25 pounds of pinto beans seasoned with ham hocks. Also, many antiques, which were representative of Junior’s youth were on display. The children also learned how to use many of them and these included corn grinders, corn shellers, coffee bean grinders (which members used to make their coffee), butter churns, butter molds, slaw cutters, wringer washers, wash tubs and boards, iron warmers, egg baskets, apple peelers, crocks, hand quilted quilts, and bed warmers. The children enjoyed crafts, face painting, stirring the apple butter, a candy toss, making and eating caramel apples and making homemade butter which was “delicious with fresh warm biscuits,” according to church members. It was a full day of meals and fellowship, beginning with eggs, fried potatoes, biscuits and gravy for the early birds. For lunch, there were hot dogs, pinto beans, creasy greens, fried potatoes, coleslaw, different varieties of cornbread, fried apples, apple pies, pumpkin pies, homemade ice cream and a birthday cake for Junior. After everyone was fed and the apple butter was finished, gospel bluegrass music was performed by Bill Nance and the Bluegrass Boys. Junior, who had earlier in his life, sang with The Christian Four, joined the band in some gospel tunes. Similar to days gone by, the band members didn’t receive money for payment, though church members gave each a quart of apple butter and fed them. Near the closing of “Old Fashioned Day,” young and old alike rode on an “old fashioned” hay ride through the community. In addition to members of the church, members of the Ashton community also turned out for the 100th birthday celebration. Information for this article submitted by Karla Ball.